Rainy day. No budget for now. Crag is too far. Guide is unavailable. Uneasy at the company of pro climbers. No experience in climbing. Need more power, strength, and practice. These are all common reasons why people shy away from ascending their favorite routes in the crag, continue honing their techniques, or pursuing their interest in climbing. That is until now. 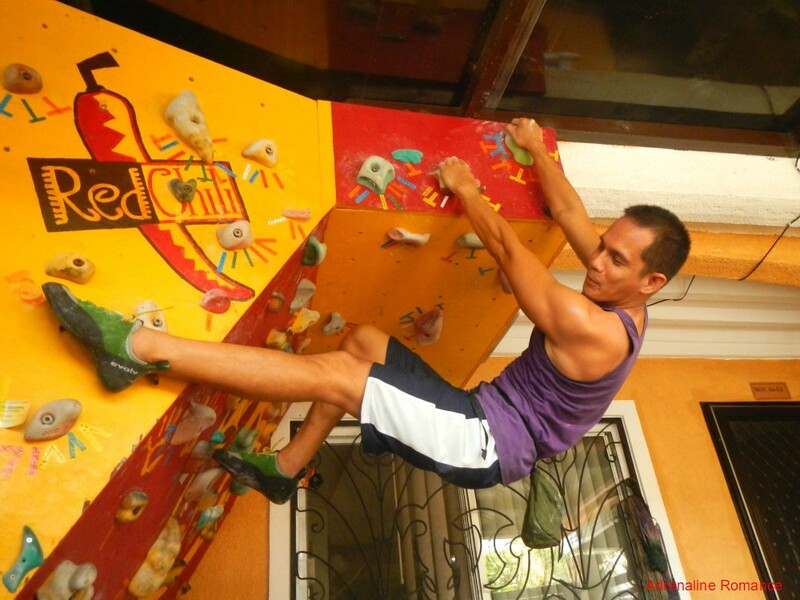 Today, Payag Bouldering House, a humble bouldering cave in Lapu Lapu City, gives you no reason why you should skip climbing practice, stop climbing altogether, or cease chasing your passion in ascending rock walls. 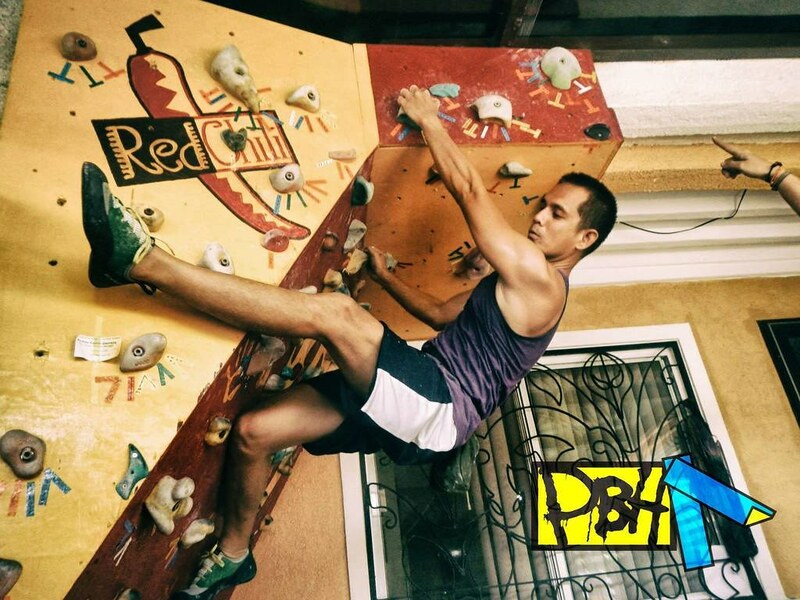 Payag Bouldering House is the brainchild of Tiki Allado, an experienced outdoorsman and a good friend of ours. In 2014, career and family life caught up to him, necessitating a long hiatus in doing the outdoor adventures he wants. Thus, he constructed a bouldering cave in his house to keep fit and to continue practicing his climbing techniques. Two years after, he decided to open the wall to climbers who want to hone their skills in a friendly, homey setting. Having a bouldering cave in his home also meant that climbers can have fun even when it’s raining outside. When we arrived at his house, Sir Tiki warmly welcomed us. Wasting no time, he introduced us to a module that describes the basics of bouldering. 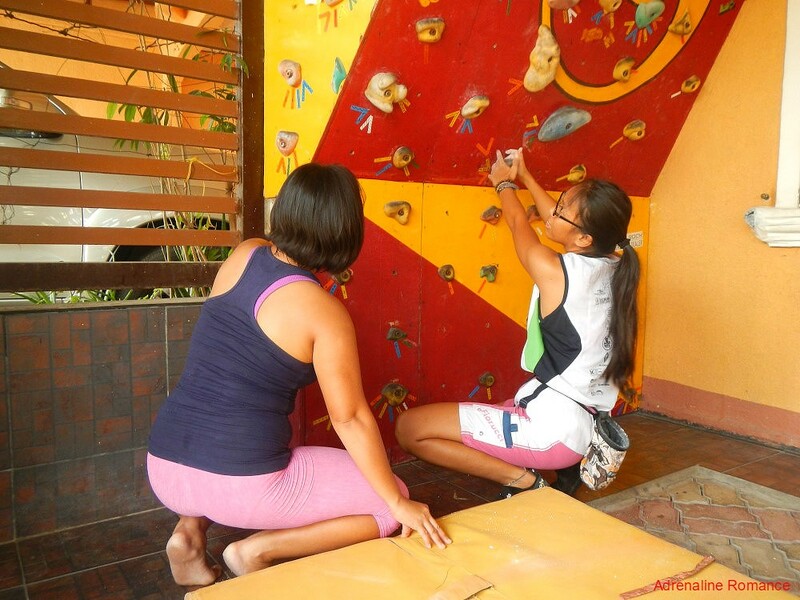 If you are a first-timer in bouldering, wall climbing, or rock climbing, we recommend you take this short one-hour beginner’s module. It explains the history and advantages of bouldering, terminologies, grading, basic techniques, and more. After we were done with the module, Tiki took us over to his bouldering cave. He explained how to read problems or bouldering routes. 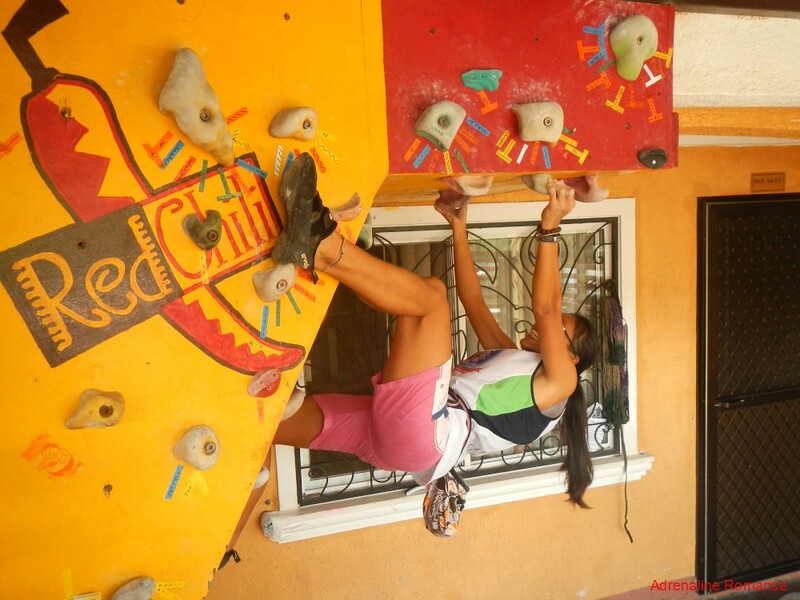 Payag Bouldering House’s holds are made of high-quality, light, and strong polyurethane plastic that are bolted on a sturdy steel frame. Hex-head bolts are used to fasten the grips to the frame. They are easy to attach and remove, so an endless variety of holds can be laid out to establish new routes. The holds are marked with various colors of tapes. The specific holds of a particular problem are denoted by a particular tape color or design. When trying to accomplish a given problem, a climber is only allowed to use the holds of that problem’s designated tape color or design. Don’t let its small size fool you. That cool woody has over 30 bouldering problems of various difficulties to try. 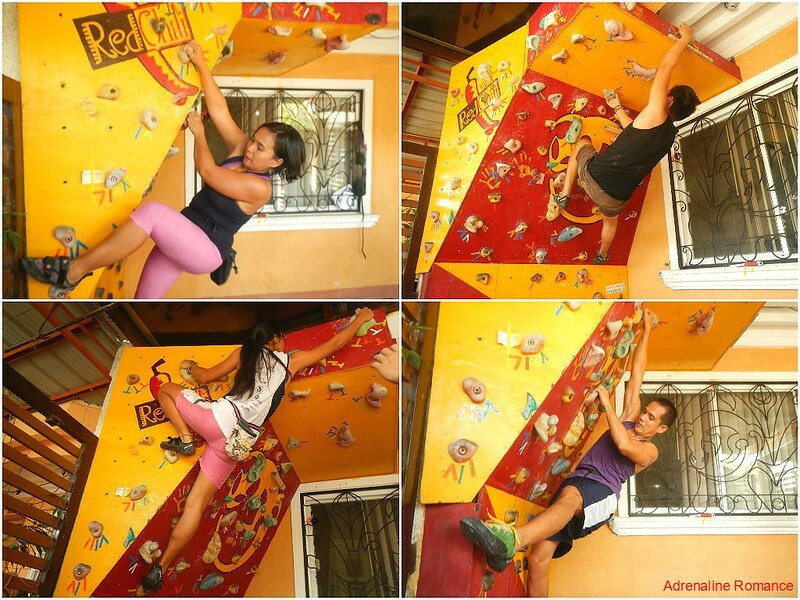 Being part of a residential property, climbers have the freedom to climb all they want in a friendly, homey atmosphere. Thick bouldering pads are available to cushion the impact of a fall. 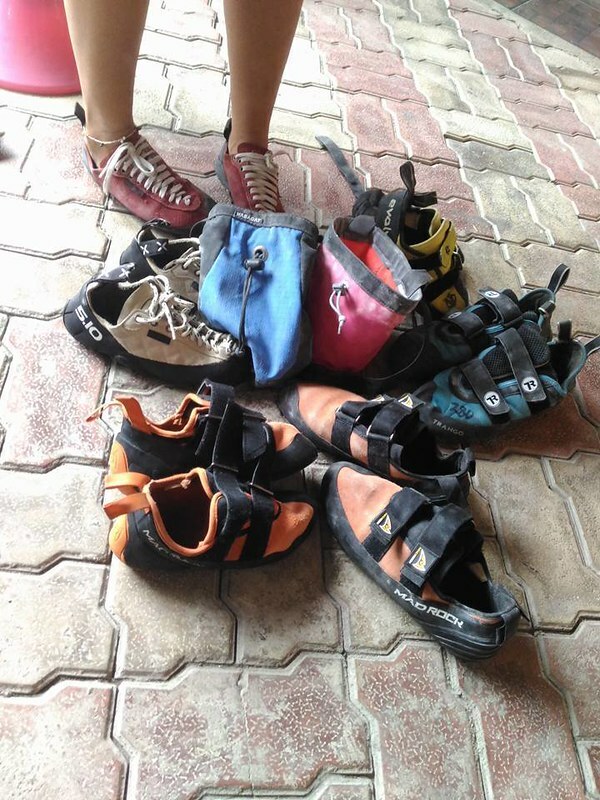 Sir Tiki explained to our friend and fellow climber Apol the various parts of a climbing shoe. Each part has a particular use in bouldering. It’s time to check out this small but superb woody. Don’t worry if you are having difficulties reading the routes at first. Sir Tiki will point out to you the holds as you work out the problem. As you ascend up the wall, your strength is sapped, your fingers tire, your balance becomes precarious, and the possibility of falling increases. But don’t worry because Sir Tiki and your companions can spot you. To spot a climber means positioning your hand so that if he or she falls, you can guide his or her fall to the bouldering mat on the floor. Proper spotting is essential to prevent injuries. 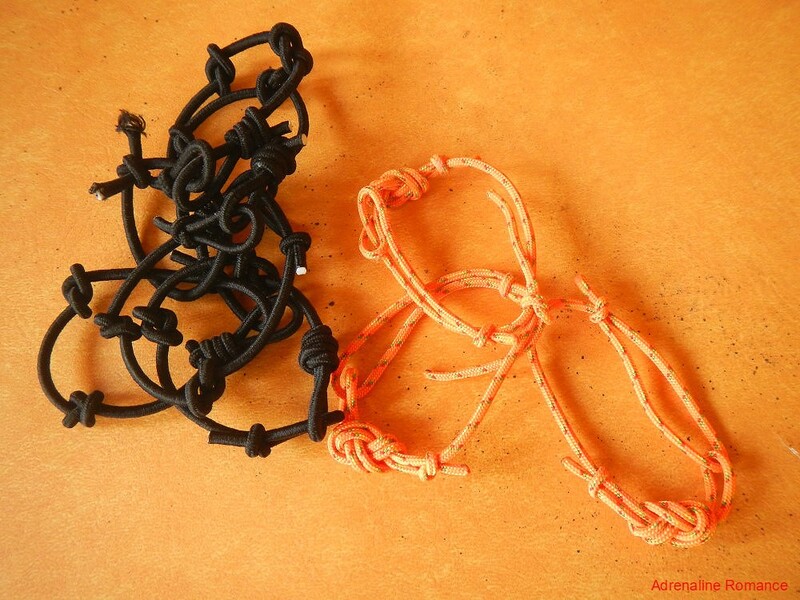 Sweetie and Apol discussed ways on how to overcome a particularly challenging problem. That’s the nice thing about bringing a bouldering buddy with you. Sir Tiki showed us a few exercises to hone our techniques. The exercises are simple enough but are effective in strengthening your grip and enhancing your muscle memory. Apol practiced a technique called flagging. Flagging involves holding a leg or foot in a position to retain balance rather than to support a climber’s weight. Here, Apol is practicing a reverse inside flag wherein the supporting foot crosses in front of the foot that is on a foothold. Sir Tiki has a variety of training equipment to help improve your power and strength. 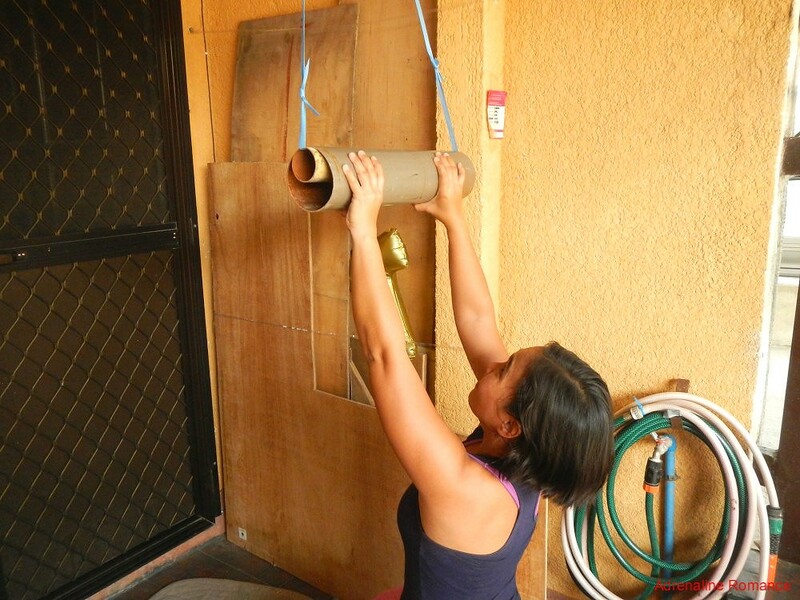 This clever homemade contraption made of smooth PVC helps beef up your finger strength. 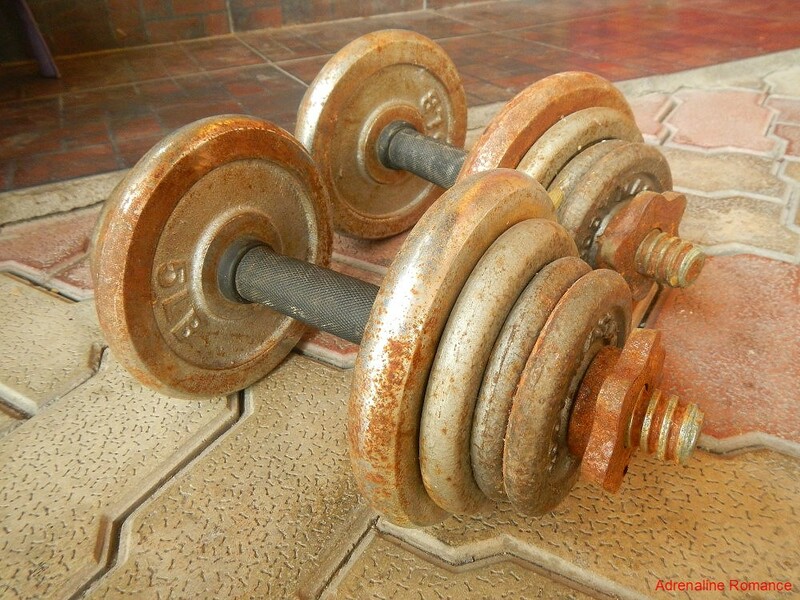 And of course, who wouldn’t miss the good old dumbbells? Great for all-around strength building. No climbing shoes? No problem. You can rent a pair from Payag Bouldering House. Apol tried a particularly difficult problem that involved climbing a steep overhang, executing a heel hook, and hanging on by the fingertips for dear life! Every time you succeed in solving a problem, Sir Tiki gives you a nice, cool, custom-made bracelet. Bouldering started out as a training method for roped climbs. Eventually, it became a sport and evolved into a separate activity sometime in the 1900s. For amateur and experienced rock climbers, bouldering is a great exercise to build stamina, increase finger strength, enhance power, and hone techniques. 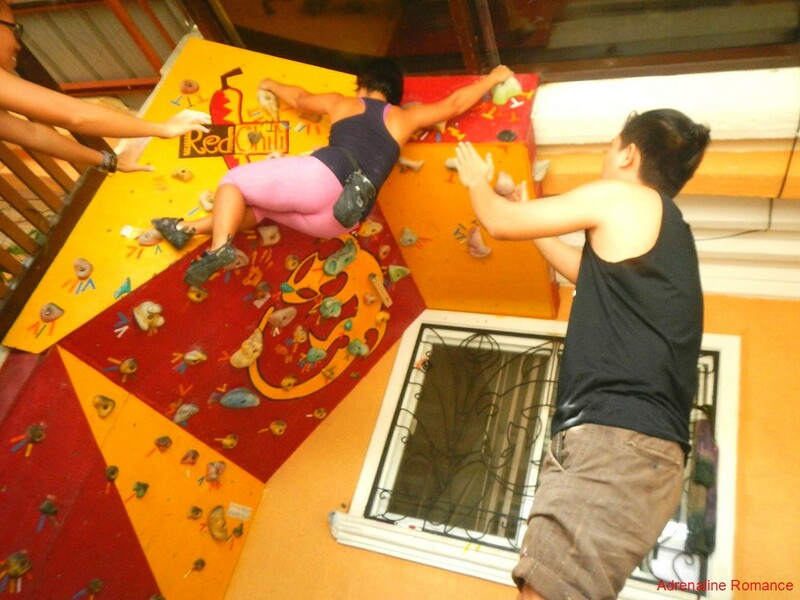 For those who are interested in rock climbing, it is an ideal starter to give them an idea of what climbing is. This can be done without the hassle of procuring expensive climbing equipment, traveling long distances to crags, exposing oneself to the onslaught of harsh elements, and other inconveniences associated with outdoor activities. The couple that climbs together stays together. Hehehe! That’s Sir Tiki and his wife BGirl. While Sweetie and I solved bouldering problems, Apol and Josephine, a neighbor of Tiki and an officemate of Sweetie, observed our moves while they took a break. Of course, we had a whole afternoon of awesome bouldering fun in PBH. We successfully—and unsuccessfully—solved several problems, laughed with friends, improved our skills, and learned another aspect of our favorite pastime. It is awesome to know that we now have a nearby place to run to if we feel the immediate, uncontrollable need—the irrepressible need to climb—in times when heading to the crag is not an option. 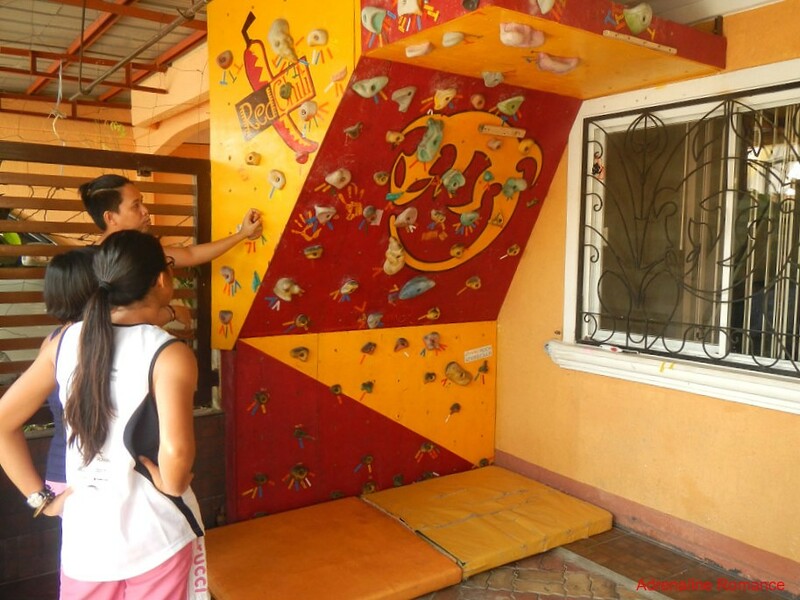 For people who want to want to venture out into the world of climbing, Payag Bouldering House is the place to be. You can climb all you want, succeed and fail in every way, without the uneasy, out-of-place feeling of being with pros in a standard climbing gym. The wall is practically built in the garage of a residence, so you will enjoy a homey, friendly atmosphere. Also, Sir Tiki is a knowledgeable instructor. He can introduce you to the sport, show you various techniques, and more. For climbers and boulderers, PBH is an ideal training ground to prepare yourself for your next bouldering competition or for that project in the crag. 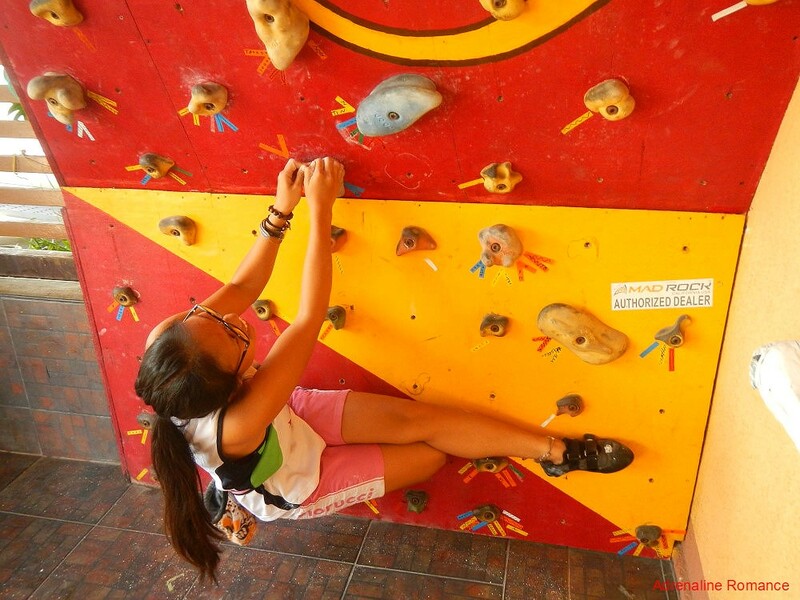 Visit Payag Bouldering House now! Since this is a residential property, we won’t put the exact address for obvious security reasons. We can only say that this woody is in Lapu-Lapu City. Please get in touch with Tiki so he can give you directions to his home. 1. 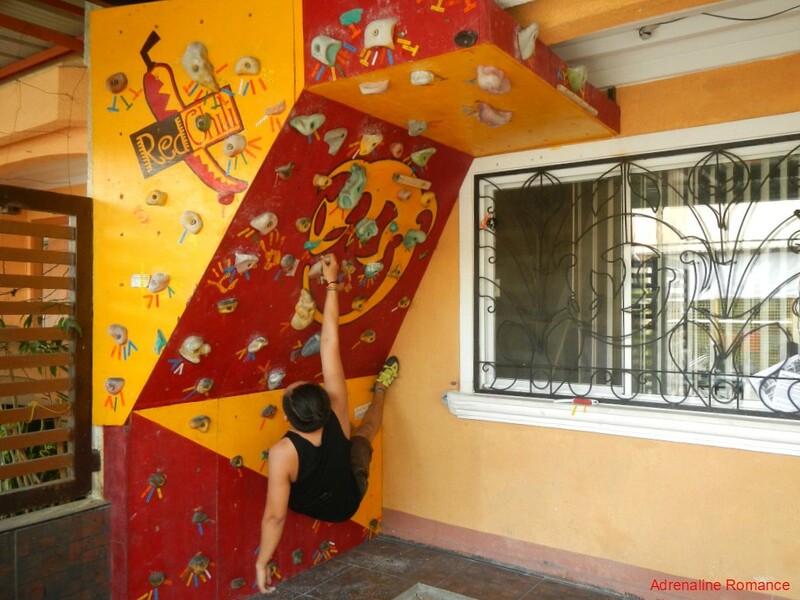 Payag Bouldering House is located within a residential area. So expect curious stares from passers-by as you scale up the wall. Most of the residents are not familiar with bouldering. 2. The community where PBH is located has a lot of sari-sari stores. So snacks, drinks, etc., shouldn’t be a problem. No smoking though. 3. Don’t get intimidated by the climbers in PBH. All of them are really friendly once you get to know them. Remember that no matter how strong and skillful they are, they have also started somewhere. 5. Follow instructions for safe and fun climbing. That looks awesome! Stay fit in a fun way!! Indeed! The nice thing is that it is in a home. And you do know how Pinoys party in homes, don’t you? Hehehehe! Definitely! The good thing is that it’s just one short ride away from where we live. 🙂 So we can go bouldering at our convenience. Been checking your blog every time I do research on some places that we want to visit. And, it is great to see a very familiar faces here. Wow! I really wanted to try mountain climbing but yea, you’re right, I’m shy because have not tried since. lol! But with this, I think I can finally try! Bonus of its cheap price! Thanks for this! 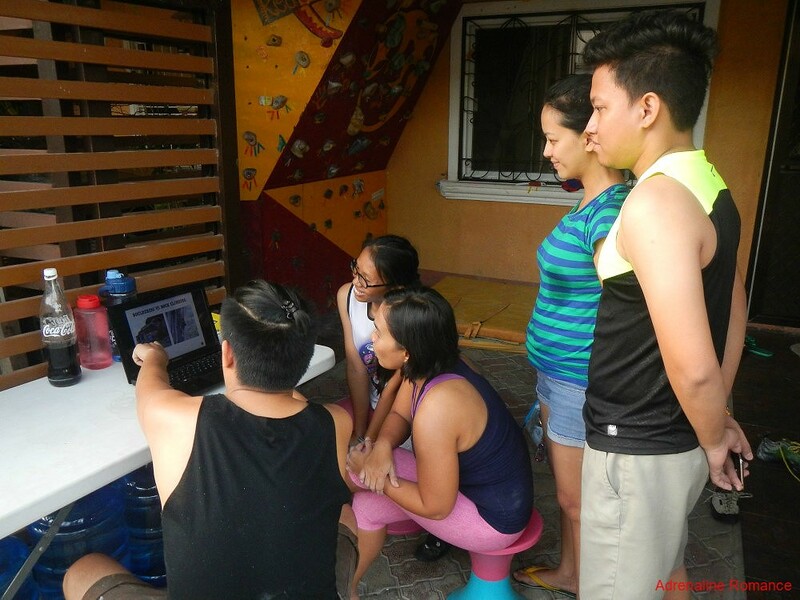 I have viewed some pictures about this Payag Bouldering House recently in your Facebook. This is made creatively and unique, thank you so much for feeding me the answers with my curiosity about this spot. You have elucidated all the necessary information that I need to know. Amazing place and this is a must try. 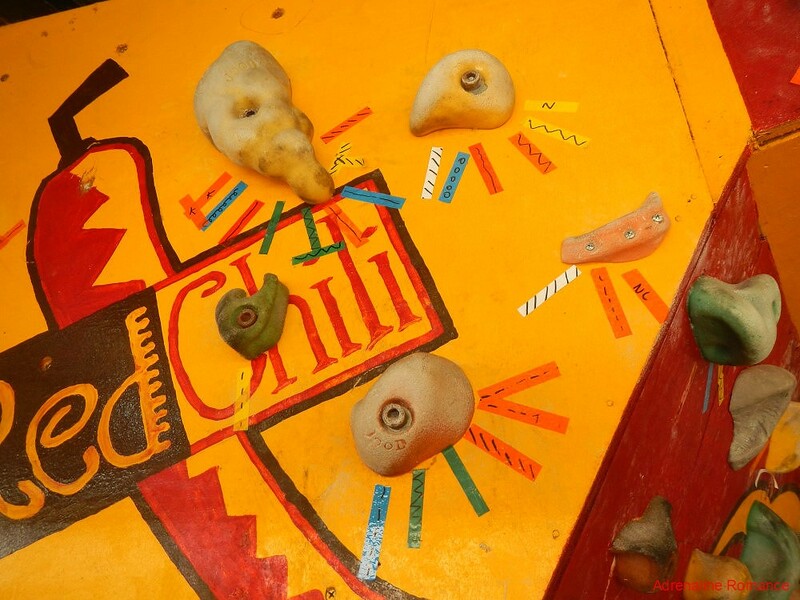 If you want to try rock climbing, we strongly suggest you check out bouldering in PBH. Sir Tiki will teach you techniques and moves that can help you ascend the rock. 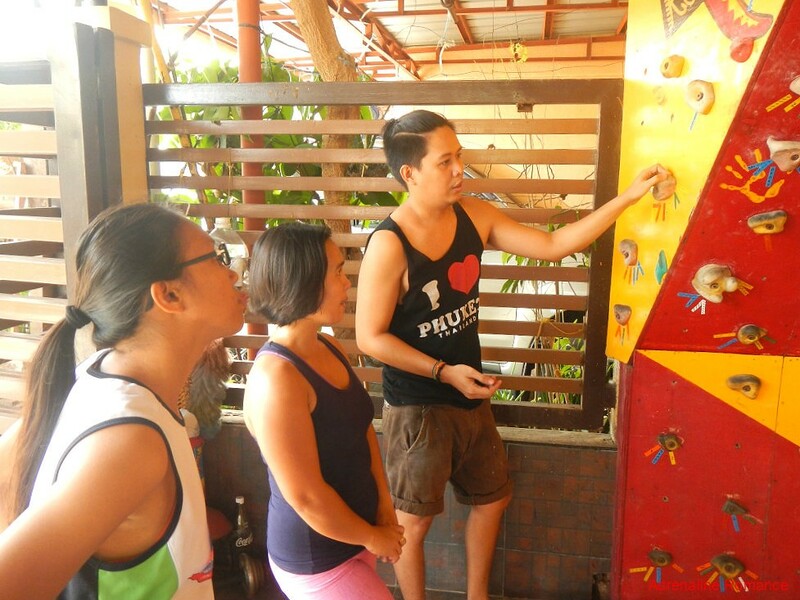 The wall is in a residential area, so you can enjoy privacy and a friendly atmosphere. Mag ask lang ko if kani na setup pwedi bani ma mobile? like balak namo rentahan ang equipments.. 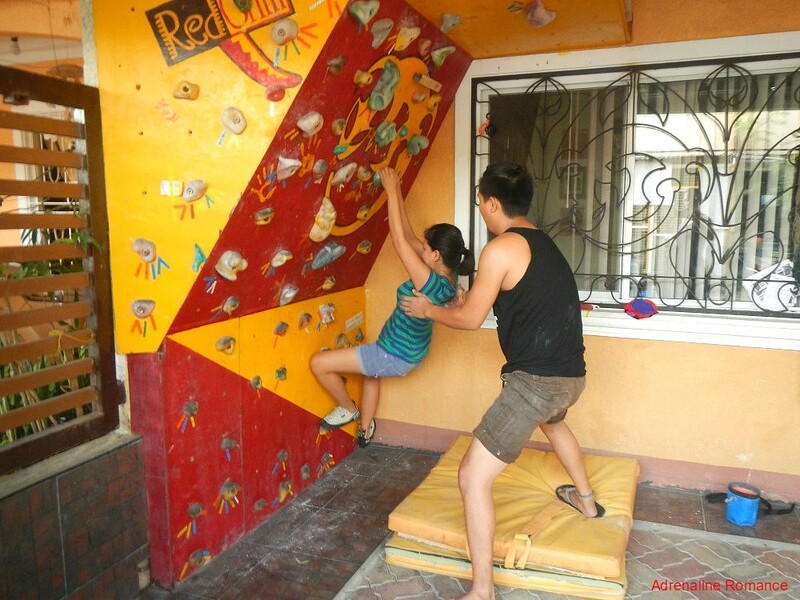 The bouldering wall is permantently affixed to the house’s garage wall, so it cannot be made mobile.